Muffin top, love handles, belly bulge, pouch, beer belly, and double chin are just some of the names we call unwanted areas of fat on our body. These deposits may seem indestructible, even sticking around after losing weight, and they reside in sensitive areas. 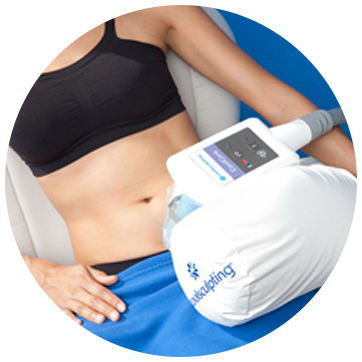 Being offered at the practice’s Aesthetic Suite, CoolSculpting is the best non-invasive fat-reduction procedure that freezes unwanted fat away with no surgery or downtime. CoolSculpting is FDA-cleared for the treatment of fat bulges in the submental area, thigh, abdomen, flank, bra and back fat area, underneath the buttocks and now, the upper arm. Patients of Drs. Feingold, Israeli, Korn, Light and Bank are invited to a special CoolSculpting event, hosted by our aesthetician Annette Pennington, on Wednesday, February 15th at 4:00pm, at the NYBRA/Aesthetic Plastic Surgery, PC offices. Join us for refreshments, hors d'oeuvres and demonstrations. Interested friends and family are welcome to join, and attendees who schedule a treatment after consultation will receive a special event discount on their CoolSculpting treatment. Space is limited, so RSVP soon by emailing Annette (click here or copy link for email). CoolSculpting freezes and kills fat cells allowing the body to naturally process and eliminate the fat cells over time...No Surgery...No Needles...No Downtime. It is so comfortable that many patients read or take a nap during treatment. A session usually takes about an hour, and requires no downtime afterwards. Patients can plan on returning to work, exercise, or other everyday activities immediately. Some patients may feel side effects for a day or two, including numbness, tingling, swelling, or bruising. Over the next three months, the fat cells are naturally expelled from the body, gradually creating a more toned physique. Hope to see you on February 15th!